The Story behind the Dress: Is it white and gold or blue and black? It is the dress that became viral overnight. Although the question still remains: is the dress white and gold or blue and black? “The Dress” is currently trending on Twitter due to the debate about the colors. 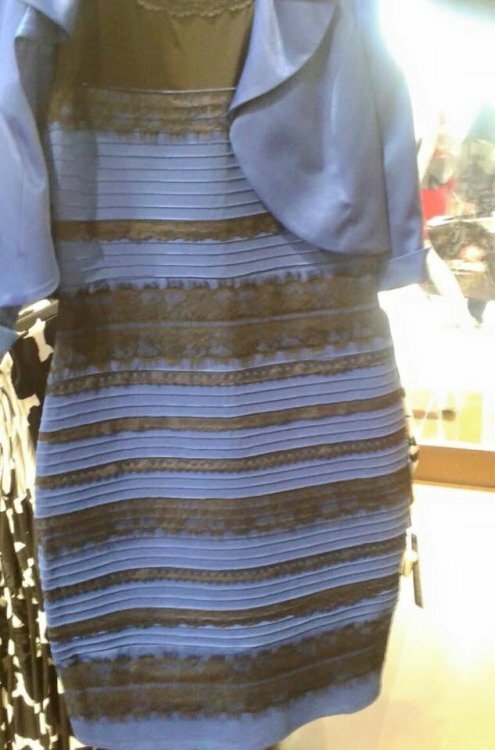 Many viewers claim the dress is white and gold while others see the dress as blue and black. On Amazon, the dress is described as royal blue and black, but some people beg to differ. Twitter users produced many theories about the differing views, including the brightness of one’s screen when viewing the photo. They claimed that as the screen brightness was decreased, the dress appeared to be black and blue. Many people mocked the dress, and one Twitter user tweeted, “Raise your hand if you’ve felt personally victimized by #thedress,” accompanied with a photo of a famous scene from the movie, Mean Girls. Thursday night, a source leaked the secret behind the mystery photo. The color someone may see in the dress is based on the emotions he or she is feeling, which is the reason that not everyone sees the dress the same way. “The Dress” was even used as a sight test by scientists to prove that your mood can affect your vision tremendously. So what color do you think the dress is? Kylie Jenner Purchases $2.7 Million House: See Photos!